When your teeth are missing, or not as healthy as you’d like them to be, it can keep you from enjoying your life to its fullest. Dental implants can restore your smile and give you back the confidence to do the things you love. Implants are stronger than your own teeth because they fuse directly to the jawbone. Restorations (such as crowns, bridges and dentures) supported by dental implants will look, feel, and function just like your own teeth. You’ll be able to live the life you want, knowing that you are able to speak, eat, and laugh with confidence. 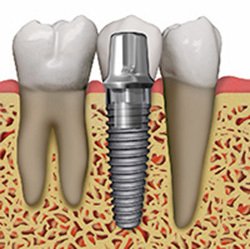 Dental Implant with abutment and crown. 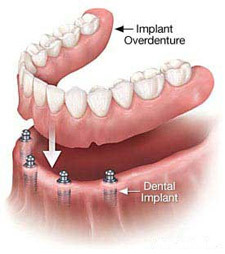 Many people can benefits from the fantastic results offered by dental implants. If you think dental implants might be right for you, you’ll work with Dr. Barwick and an oral surgeon to address your specific concerns. You’ll undergo a dental exam and X-rays to ensure you are a good candidate for the procedure and help make your procedure a successful one. Dental implants involve two phases: the first procedure is the surgical placement of the your implant(s), and the second is to prepare the your implant(s) to receive your new restoration(s). A small titanium anchor, called a “root form” implant, will be inserted into your jawbone under the gum. Over the next few months, the bone will grow around the implant to create an extremely secure base for your restoration. This is much like the cement base used for a mailbox, and will keep your new restoration stable. Once the surgeon has verified that the implant has fused with the bone, Dr. Barwick will take impressions, and the dental lab will begin crafting the restoration(s). Once complete, the restorative creations are attached to the implants, giving you back a stronger, more beautiful smile. The entire process usually requires approximately three to six months. During that time, you should experience very little disruption in your daily routine. If you wear dentures, you know that the full upper denture is generally more secure and more comfortable than the lower denture. That’s because your palate (the roof of your mouth) creates a small amount of suction that helps keep the upper denture in place. The lower denture, however, does not have this suction and tends to slip around, causing a great deal of you discomfort and wearing away at the bone and over time. Many people who need to wear a full lower denture lead limited social lives due to the embarrassment of their unstable denture. Implants can help eliminate many of the problems typically suffered by patients with lower dentures, especially helping to preserve the bone of the lower jaw. Dr. Barwick and the oral surgeon will work together to give you several new implants that will secure your lower denture in place and greatly improve your comfort. 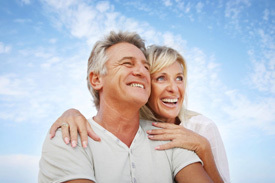 Let’s talk about whether dental implants are the right solution for you. Contact us at (978) 957-5511 to start the conversation with Dr. Barwick and see how beautiful your smile can be.